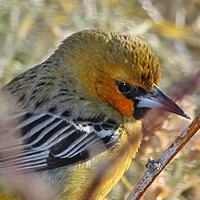 Icterids make up the family Icteridae of small to medium-sized, often colorful, New-World passerine birds. Most species have black as a predominant plumage color, often enlivened by yellow, orange or red. The family varies widely in size, shape, behavior and coloration. The name, meaning "jaundiced ones" (from the prominent yellow feathers of many species) comes from the Ancient Greek ikteros via the Latin ictericus. This group includes the New World blackbirds, New World orioles, the bobolink, meadowlarks, and grackles. 17 species of icterids have been recorded in Utah.